Several years ago, I made this pot up as part of our vegetable garden display. It was just meant to add a little fun and whimsy to the nursery, and to show people what you could do at home with a little creativity. But people kept trying to buy it, and I only had one, so I had to keep saying "I'm sorry. It is only for display." Before I could take a "perfect" picture, a new cashier accidentally sold it, but luckily I had snapped this photo with my phone. I'm not sure if you can see the detail, but you can choose from several colors of bowls, and matching salad tongs. Once mature, you will be picking lettuce for sandwiches and salads almost daily. Make two and you can feed your family pesticide-free food for months. Here is another instance where I got a great deal in Atlanta. 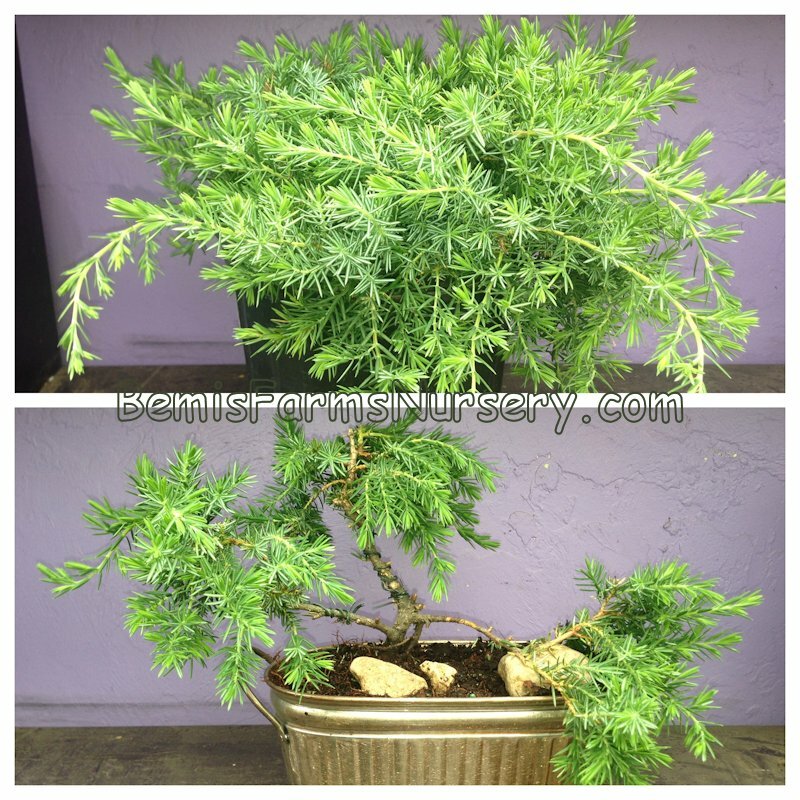 I searched through hundreds of showrooms, looking for interesting things to grow plants in. While there were a lot of birdcages around, most were ridiculously expensive. But tucked away at the bottom of a shelf, I found some reasonably-priced ones, similar to the one shown in the picture that I found on the internet. 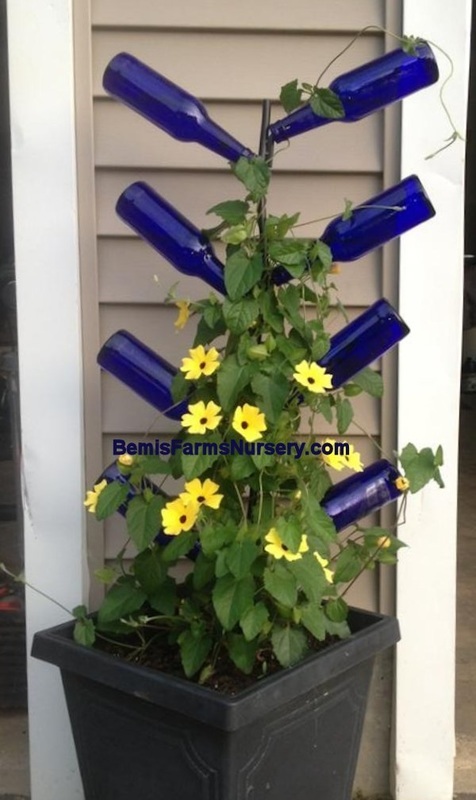 This year at the Atlanta Gift Show, the vendor who sells us the bottle garden trellises actually had the little blue bottles in the picture I have been using for years! So this class will include the bottles. 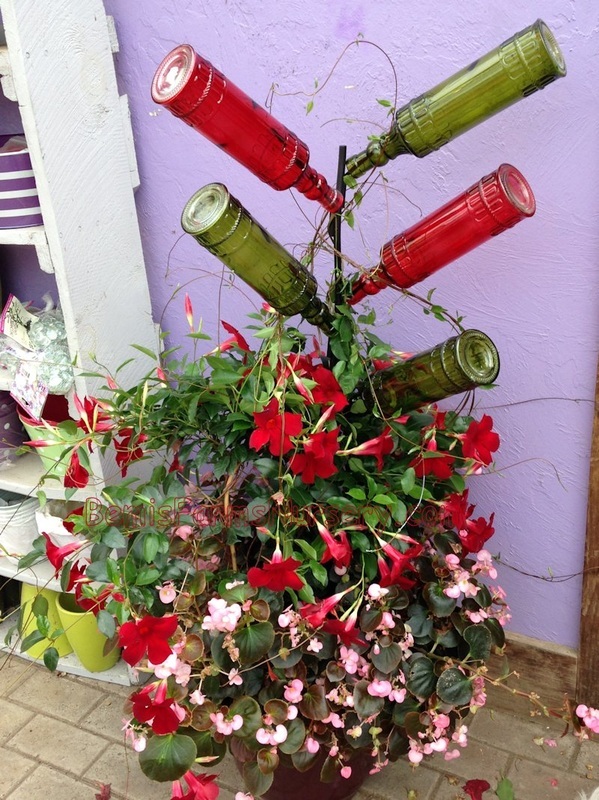 In this bottle garden, we will be using an upgraded plant, tropical Mandevilla in red or pink, to climb up the trellis. Because this plant costs more, you will have to use your own bottles, like these I found at the dollar store. Or you can use plain wine bottles. Another option is to spray them with the new spray paints that mimic sea glass. I forget the brand name, but I picked up a can at Klem's last fall and tried it. It works really well! We got an amazing deal on some big, colorful metal trugs (because they leaked, but we drill holes in them anyway! ), and we are passing along the savings to you! You will get soil and TONS of miniature plants like creeping thyme, sedum, Irish and Scotch moss to landscape your garden, as well as colored pebbles for pathways. 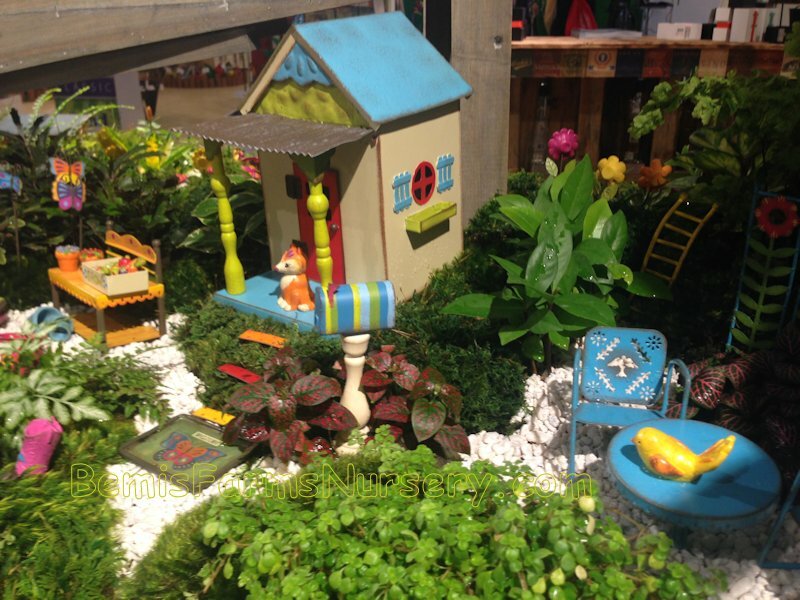 Then you can purchase any extra accessories from our EXPANDED Fairy Garden accessories nook. Wait 'til you you see what treasures we found! (To simplify check-out, please, no outside accessories.) Plus, creating a fairy garden is a wonderful way of introducing children to gardening. This is an adult class, but feel free to bring a child and share some quality time: Show him or her how fun it can be! That's why we scheduled this class during school vacation week. When children succeed at gardening, you give them the tools for a lifetime of joy. There are not too many things in life more satisfying for me than wandering out on my deck and plucking a few sprigs fresh herbs as I prepare supper. 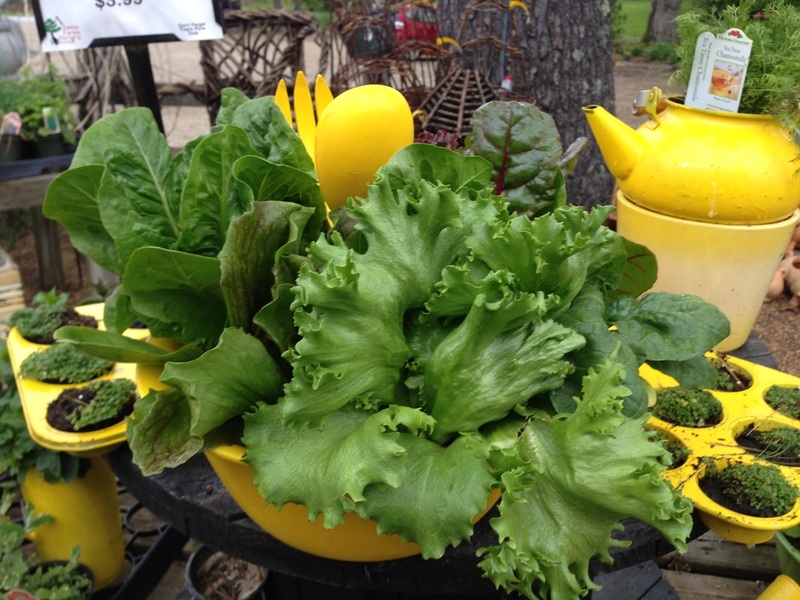 You’ll be amazed at how much you will be able to harvest from this container by the end of the season! You will put three pots, each decreasing in size, on top of each other to create a very large surface area. 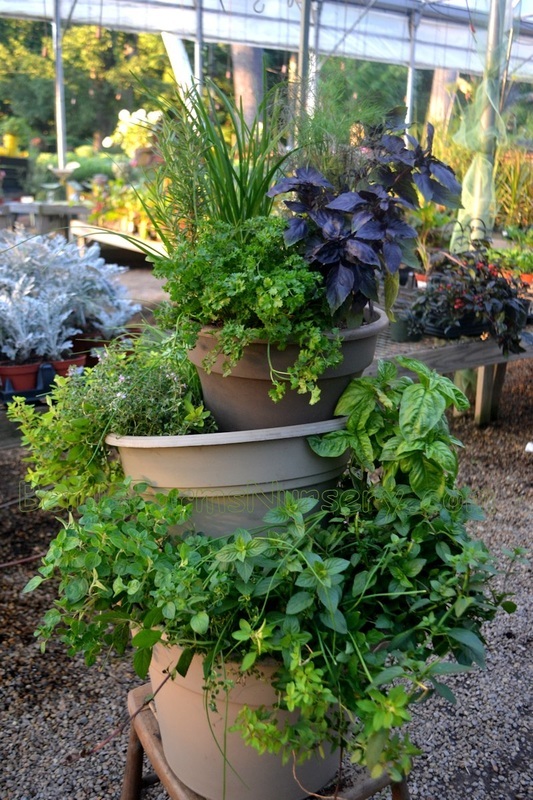 This way, you can fit ten different culinary herbs in a concentrated area. The secret to being able to put so many plants in one place is you must harvest them regularly. You shouldn’t have any problem doing that - because you don’t have to be an Iron Chef to know that the Secret Ingredient is Freshness! Wow! This is such an old picture of Tina! Perhaps you can submit your own, posing with your creation once it fills in. 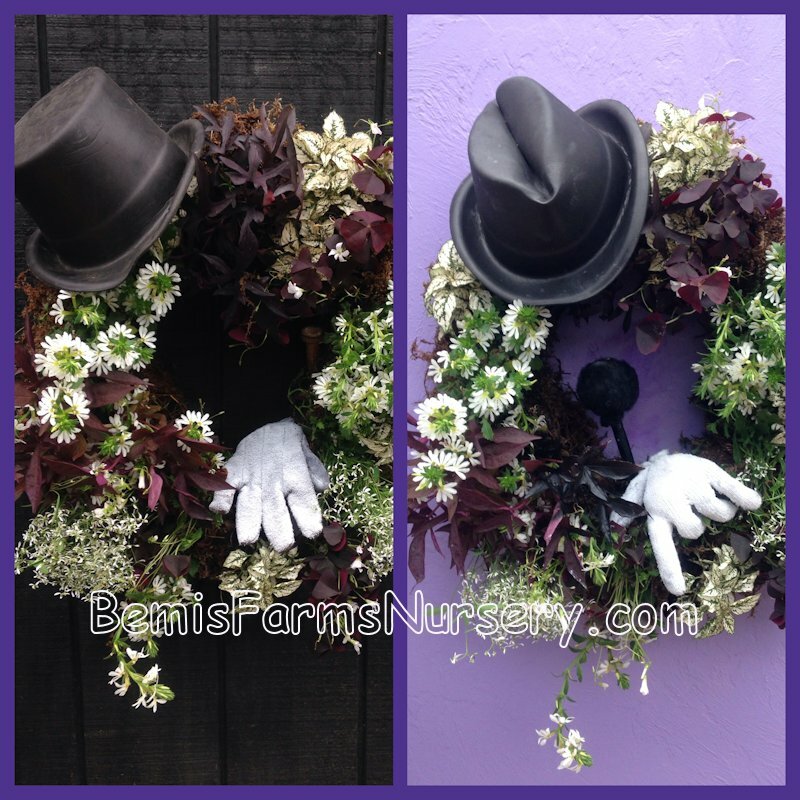 Create this wreath using a secret frame, long-fibered sphagnum moss, spool wire, and your choice of pansies. 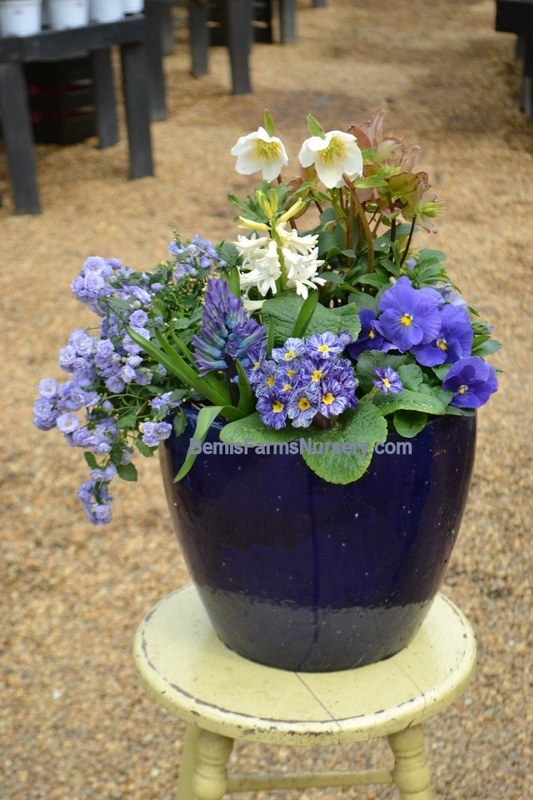 We have a limited number of the new 'Blue Zebra' primrose from the Hort Couture brand that will act as a focal point for this pot, so sign up early. This garden will be made in a resin container, but you can always purchase a blue ceramic pot during class if you would like to upgrade. It will include a selection of both annuals and perennials in blue and white. We are growing several varieties of hydrangeas this year from very young plants. 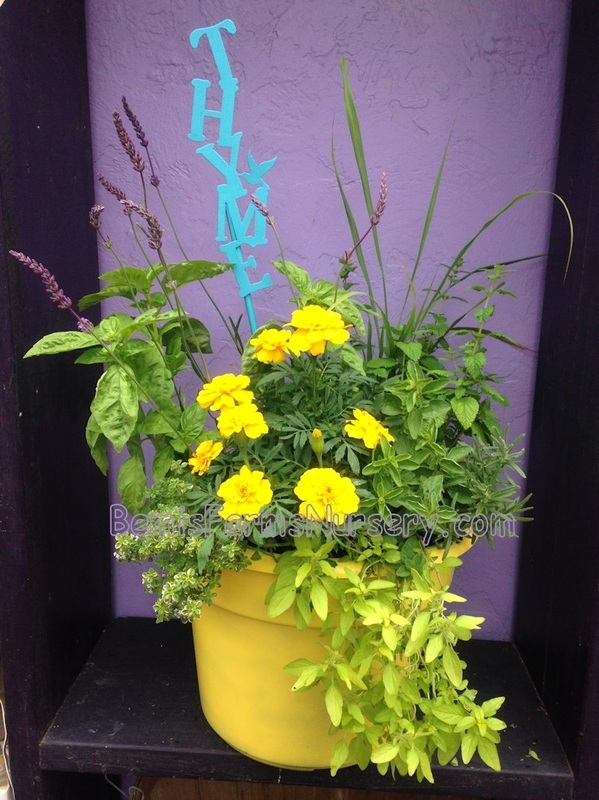 This way you can affordably put one in a container with a bunch of perennials and annuals, and watch them grow yourself! The one in the picture is called Vanilla Strawberry. At the end of the season you can plant it in your garden and harvest years and years of fresh, cut flowers for your home. So, what do you do when you have a garden full of fresh, cut flowers? Bring some inside, of course! But perhaps you need some tips on how best to arrange them. Good thing we have our resident floral expert, Bart Krug around! 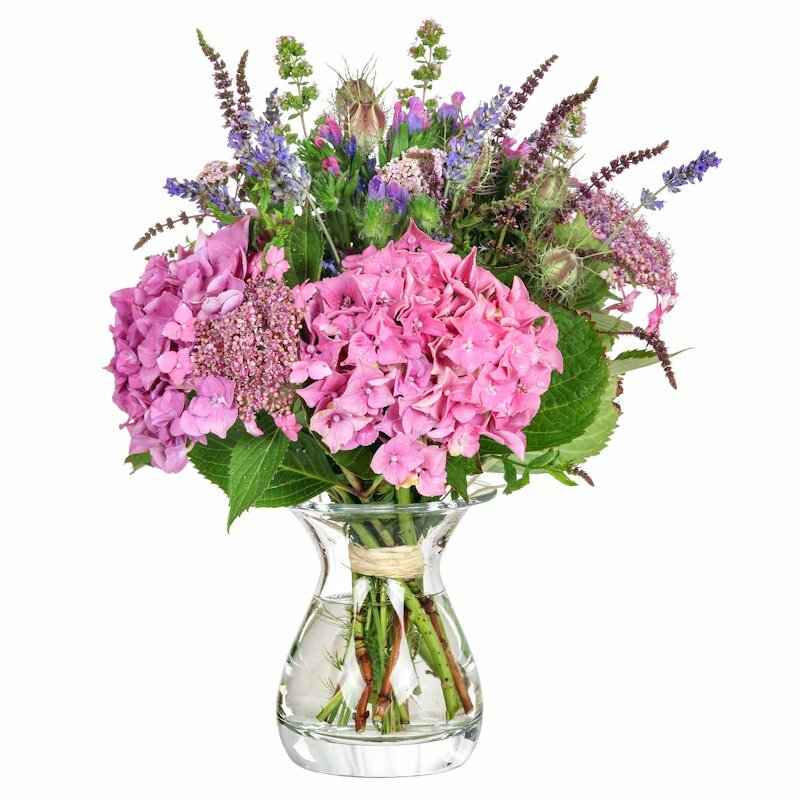 He will teach you his tips and tricks to designing in a glass vase using hydrangeas and other garden flowers which have been forced into bloom out of season to help kick off the year. 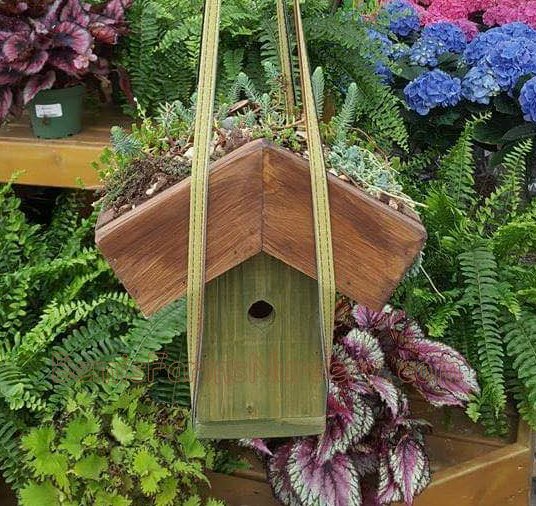 A local woodworker made me some birdhouses this winter, so I had to borrow a photo from the internet, as I didn't have time to plant one and grow it out. 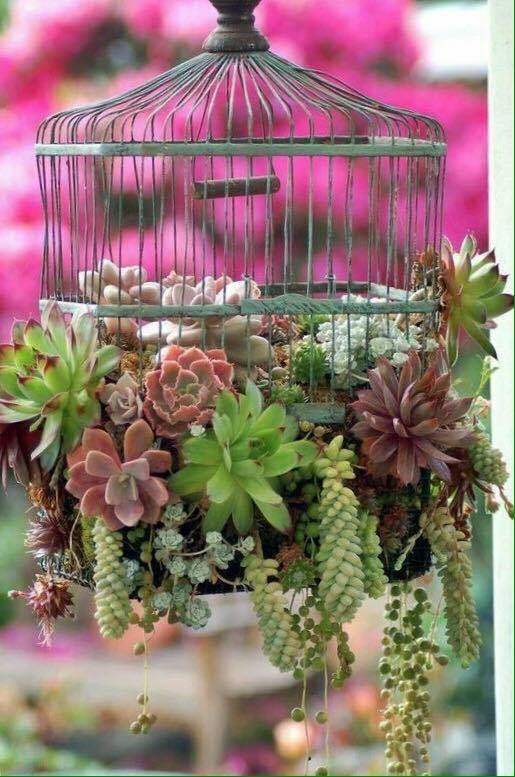 But we will plant ours with succulents, too! It is adorable. We will use some colorful, "leaky" trugs that I got an amazing deal on at the Atlanta Gift Show. Normally retailing for $30 each, I got them for a song because they won't hold water if used as an ice bucket to keep sodas and beer cold. The vendor kept reminding me that they leaked. I kept reminding him that I was just going to drill holes in the bottom so I could plant them up! These are big and beautiful! 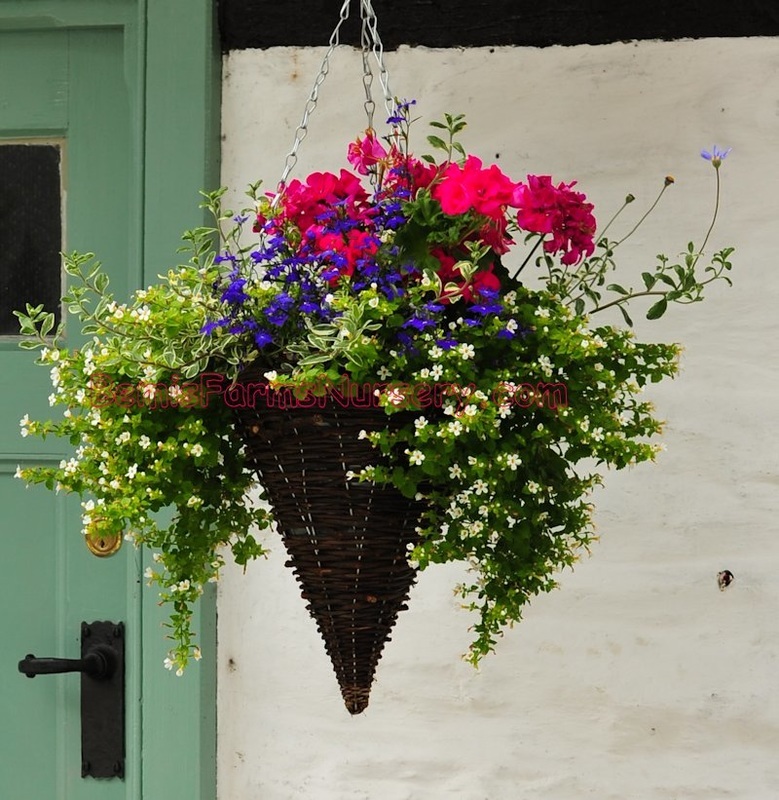 We have a huge selection of wicker hanging baskets. Most have points, some are flat. All are lovely! You will get to choose a basket, then choose your own custom spillers to match your house and sun levels. 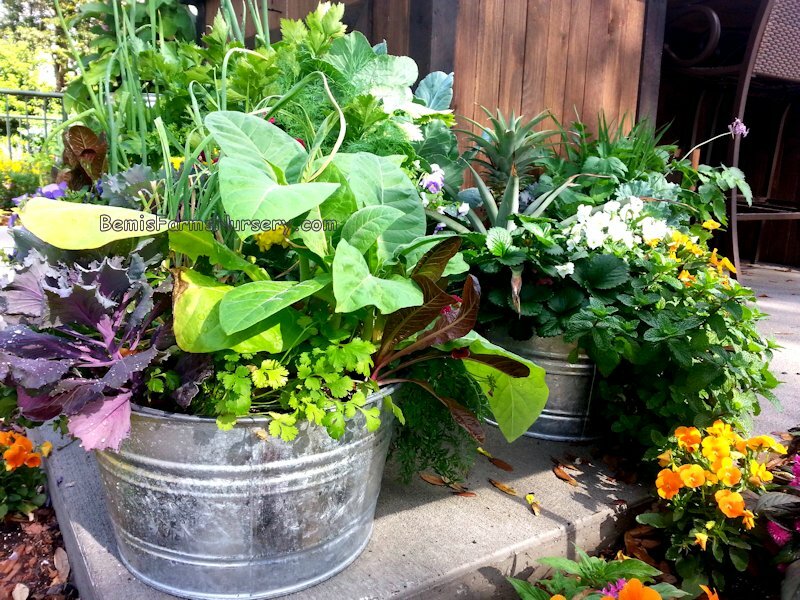 A container gardening expert with double-check your selections to make sure they are compatible. I have been making these since I was 13 years old, as they were a project in my high school's greenhouse club. We would make them and enter them in the Philadelphia Flower Show. I still love making them as much as I did back then, and you will, too! You will mix a wet batch of a clay-like cement mixture called hypertufa and mold it into a faux-stone vessel. It will look as though it has endured centuries of weather. Bring gloves & and wear old clothes to this fun, but messy, project. Pick up in three days after the concrete has set. Includes 6 Itty Bitty succulents to plant into your pot. This resin planter will fit over both 4 inch and 6 inch deck rails. 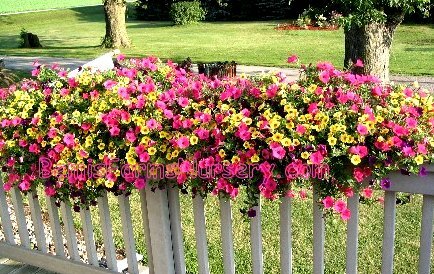 We will plant it up with Wave petunias and assortment of other, colorful spillers. This planter will last for many years of re-filling! 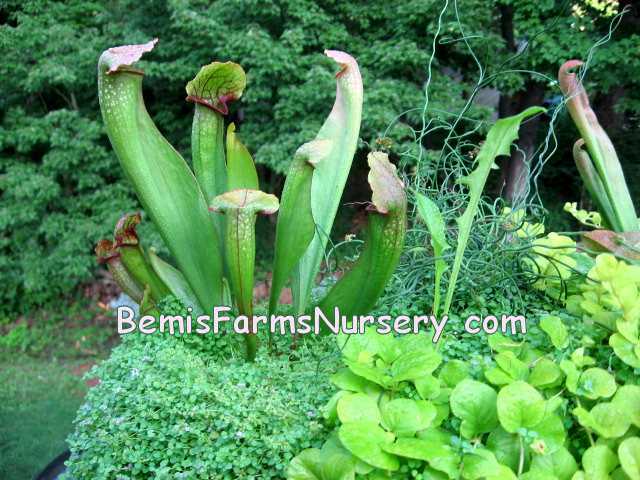 Photo courtesy of Viola Nursery. Grow a selection of water-loving plants in this bowl, including several insect-eating ones like Venus Fly Trap and Pitcher plants. This is a great class to bring a youngster to who is into science and nature! 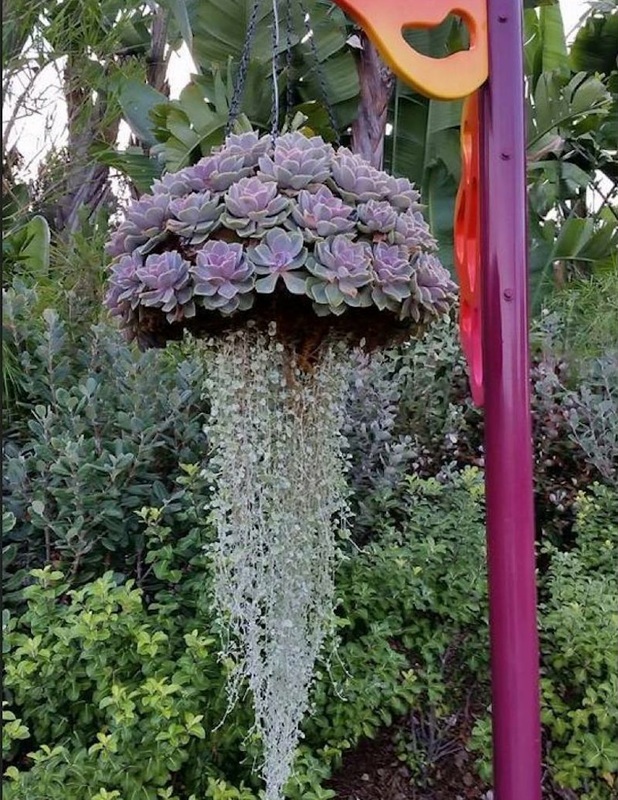 You will plant up a modest-sized wire basket with moss and a bunch of succulents called Orostachys, a quick-spreading plant that looks like the expensive Echeverias in the picture, but spreads more quickly, keeping the cost of the class in control. Otherwise, each plant would have to cost $5, and there appears to be about 40 of them in there! You've seen them on Pinterest, those plants that allegedly keep the blood suckers at bay if you plant a few around the patio. While it doesn't quite work that way, the plants used in this pot create oils that repel insects naturally, without artificial chemicals. You just need to crush some leaves and rub the oil on your skin. And when did a can of "OFF!" ever look so good? 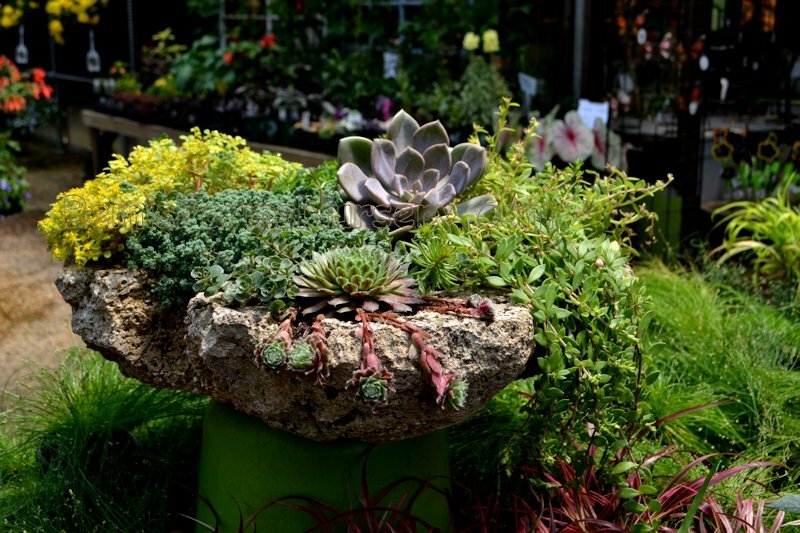 You will plant up a large, 16" moss basket with your choice of colorful, sun-loving spillers. The basket shown in this picture was grown by us, and lovingly cared for by DPL Landscaping for The Publick House in Sturbridge. 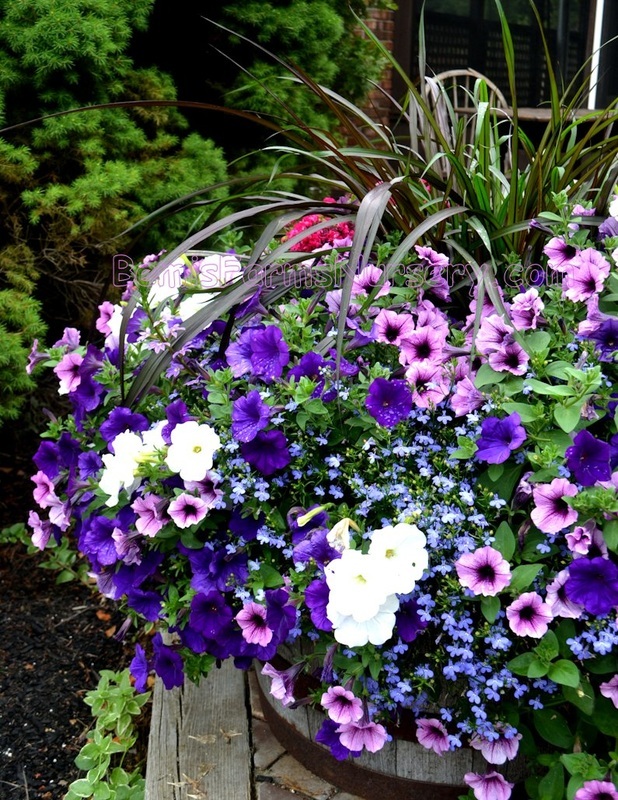 They take our advice, and are not afraid to fertilize heavily, so these baskets never go out of bloom. 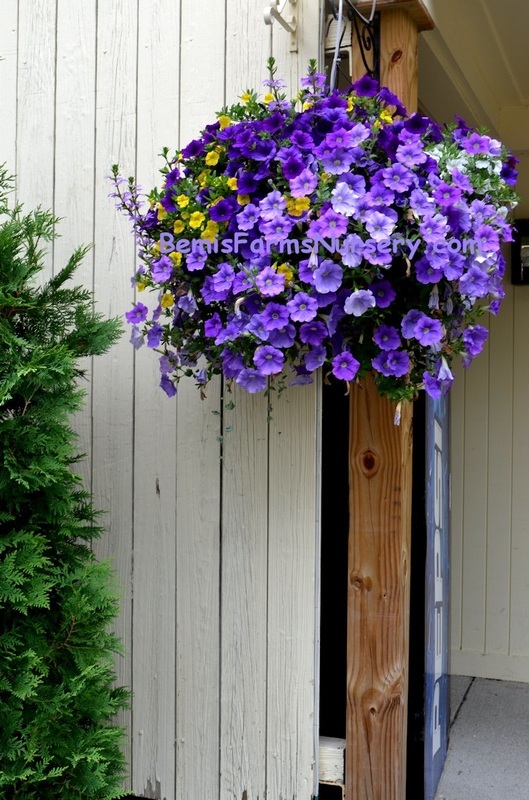 This barrel was also planted at the Publick House in Sturbridge with one of our famous hanging basket combos. Lots of fertilizer from the folks at DPL Landscaping kept them in bloom all summer. 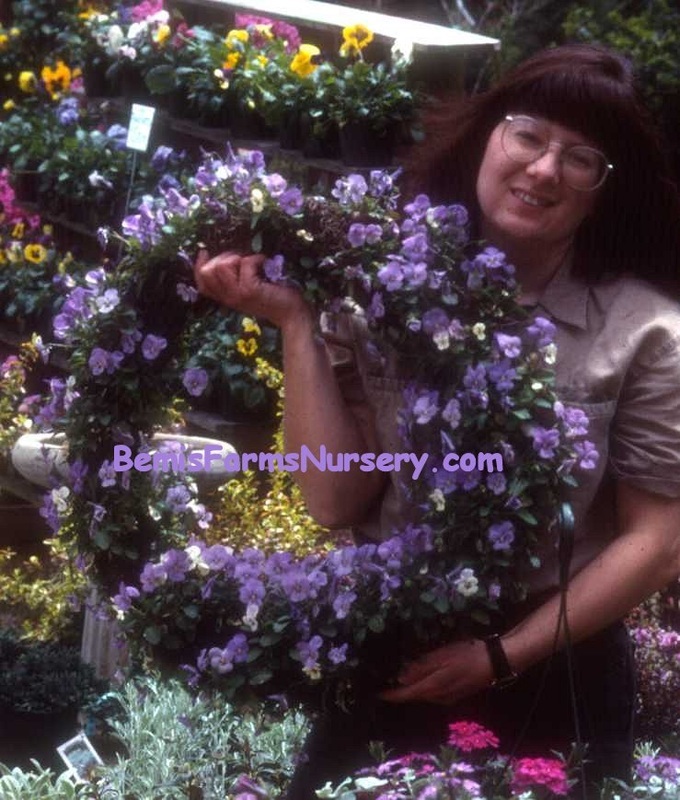 You will plant a smaller version of this barrel with your choice of Wave Petunias, and a new grass called 'Vertigo' from Proven Winners. This grass gets nice and big, and makes a huge statement by the end of the year, at which time you can remove the waves, and plant a few mums. Don't cry the next time you break a pot. 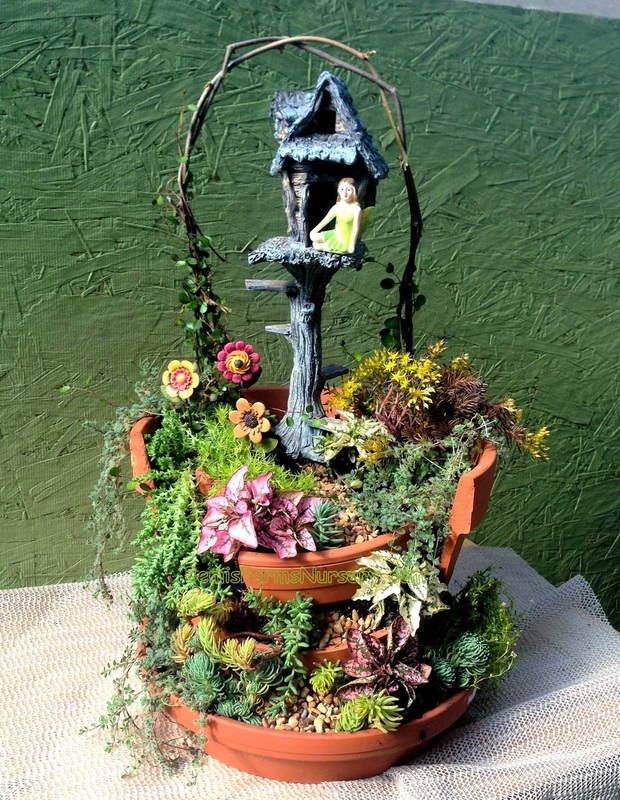 We will teach you how to re-purpose it into a cute, little fairy garden. 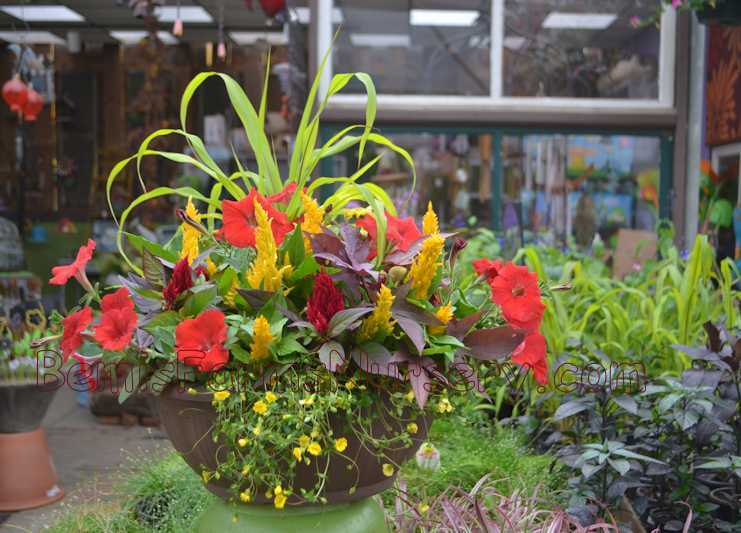 This class includes a large, clay pot, soil, plants and colored pebbles. Accessories will be available for purchase to customize your creation. This is an adult class, but feel free to bring along your favorite children. To help with check-out, please, no outside accessories. Celosia plants are the star of this pot, with feathery plumes that mimic flames, in colors that mimic evenings around the campfire. I can almost taste some toasty S'Mores just looking at this pot. Make room in your car! If you are not strong, you may just want to watch the demo, then take all the ingredients home and assemble it in place. 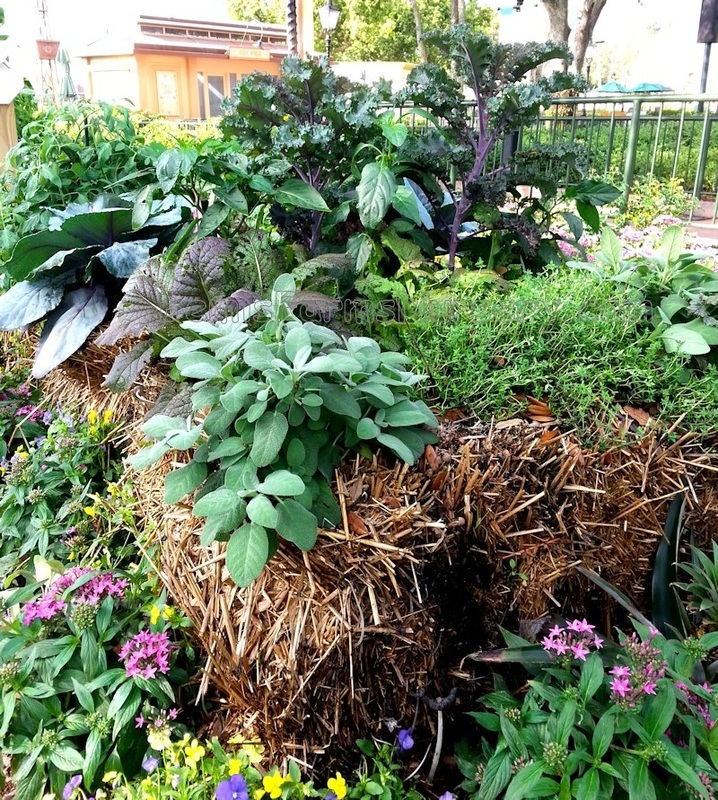 Class includes a giant hay bale, compost, and a whole bunch of summer veggies. At the end of the season you can decide whether or not you can get a second year out of it, or spread it on your garden to richen the soil with compost. 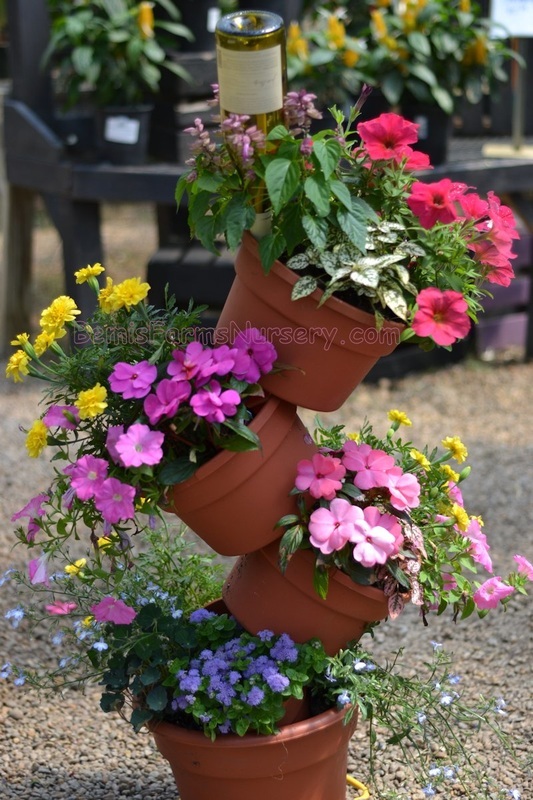 We used to call this class our "Tippy Pot", for obvious reasons, but the name change reflects the decorative addition of a wine bottle to the top of the stack! Bring your own wine bottle. (A full one is, OK, too, if you bring some friends to share it with!) We will fill these pots with a colorful rainbow of fillers and spillers. 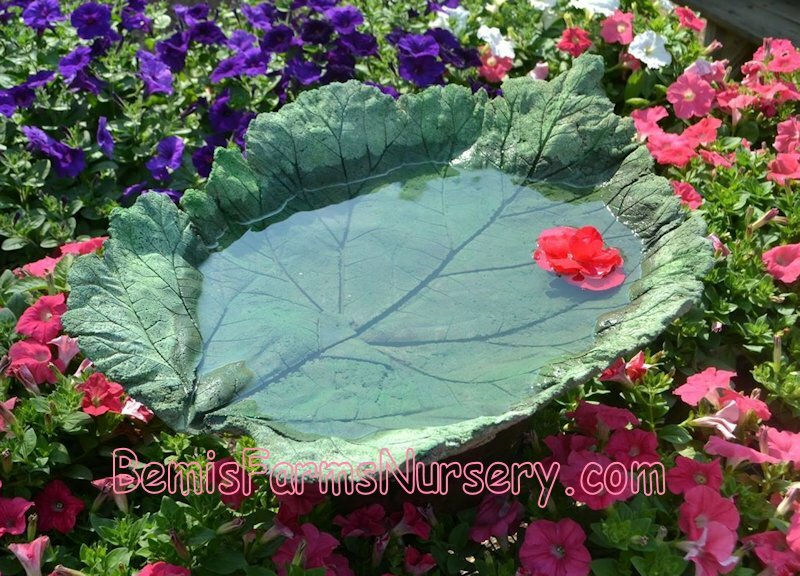 We will use an assortment of large leaves to cast this bird bath, but you may bring your own giant leaf if you have one, such as rhubarb. Leave it here for a few days, then come back to paint and seal it. Wear gloves and old clothes to this fun but messy project. 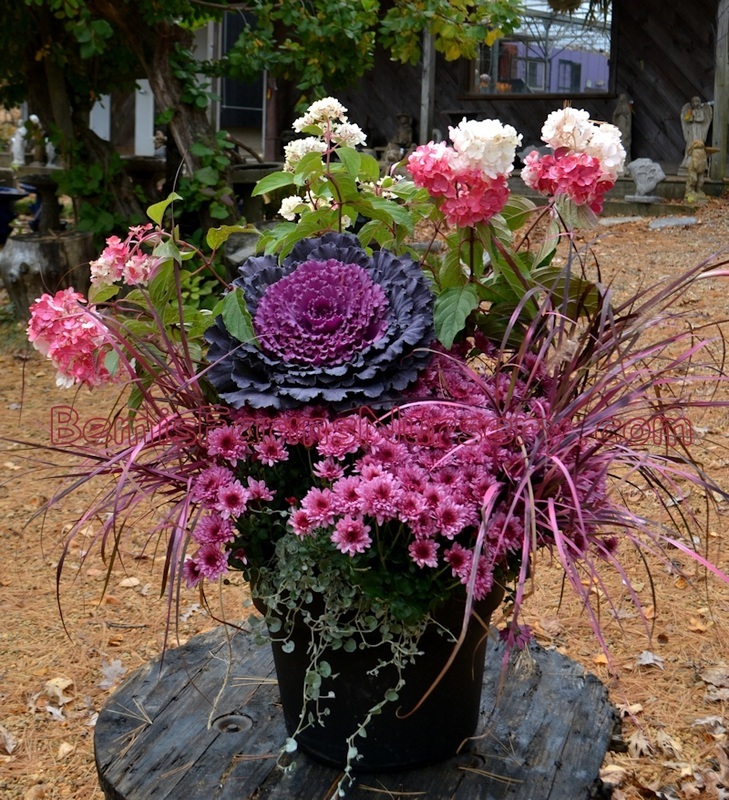 Everyone will get their choice of a giant Dahlia to act as a Thriller in this pot, then, with the help of our experts, you can choose matching Chillers, Fillers and Spillers from our regular benches, and at least one plant from our "Geek Plant" bench from our specialty grower in Pennsylvania, Peace Tree Farms. 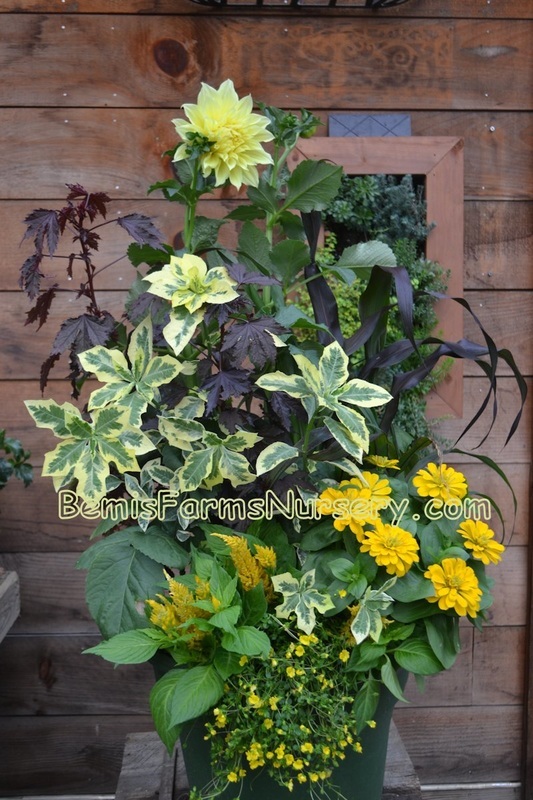 For this pot, I planted the variegated summer poinsettias, what will you choose? Yes, you really can learn this ancient Japanese art form in under an hour! (Or the quick version of i anyway.) This picture is an actual before and after picture from one of our previous participants. I had way, way, way too much fun creating this last year. I was thinking about the snowman hats that someone forgot to put away while trying to invent something different than "plants in a pot" for the summer workshop list. I also had a lot of black and white plants left over, and was thinking about the song 'Ebony and Ivory' with Paul McCartney and Stevie Wonder. So when a Michael Jackson song came on the radio, I remembered the Sir Paul and Michael song, too. I thought of the snowman hat, and the rest is history! The first efforts looked more like a magician, or Jazz Hands, or Puttin’ on the Ritz. Which do you like better? Hey, you can make it plain, too. The hat and glove are just to add some whimsy. You don't even need to make it black and white. We have a greenhouse full of plants to choose from. This looks great on a door, wall or fence, and also on top of a birdbath or picnic table.